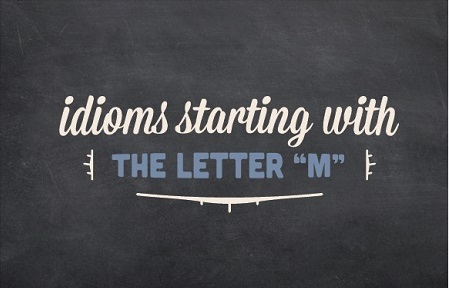 This list of M idioms includes a lot of examples to help you understand the meaning of these expressions. 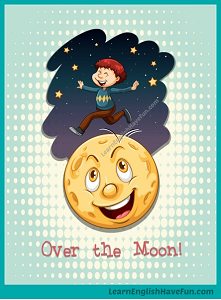 Are you afraid of using idioms? One of my former students told me that idioms actually "MADE her sick." By the end of our lesson I persuaded her that she was "MAKING something out of nothing." It's just a "MATTER of learning phrases," because you don't have to use idioms a lot in English. "As a MATTER of fact," you just need to understand them when other people use them. "For that MATTER," you can express the same meaning without using idioms. However, you DO need to understand them. made for each other: a perfect match; things that go very well together. Mmm, I think bread and cheese are made for each other. Even though your mom and dad are very different they are definitely made for each other. I want to introduce you to a girl I met last night—I really think you’re made for each other. When I was a kid I used to make believe I was a dog and I even ate from my dog’s dish a few times. I know you don’t like my friend Janie but since it’s my birthday, can you make believe you do just for tonight? make do: to use the things that you have even though it is not what you want or need. The photocopier jammed so we will just have to make do with the copies that we have. I’m sorry the salad doesn’t have much cheese—I had to make do with what we had because someone ate most of it. make for something: to produce a result. Upgrading to business class makes for a completely different experience than traveling in economy class. Always being late makes for a very stressful life. make good on something: to keep a promise; to do what you say you’re going to do. Thankfully, my sponsors all made good on their pledges of support for my 10k race. Sorry, I can’t join you tonight—my mom made good on her threat to not let me use the car until my grades are better. make it: 1) to be successful; 2) to go to an event or place. When my first book proposal was accepted by a publisher, I knew I’d made it as a writer. Can you make it to my party Saturday? We finally made it to the train station five minutes before departure. make it big: to achieve great success at something; to become famous. I wonder if we will still be friends when you make it big in Hollywood. Before Mariah Carey made it big, she was a waitress and back-up singer for Brenda K. Starr. make it up to someone: to do something nice or good to compensate for something you did wrong or failed to do. I'm sorry I missed your softball game. I'll make it up to you by taking your team out for ice cream after your next game. This new diamond bracelet is my husband's way of making it up to me for forgetting our anniversary. make light of something: to consider something as less important or serious than it actually is. My mom tried to make light of my breaking her china bowl but I know that it was really special to her. I made light of my friend’s comment that I was fat but it really made me upset. make off with something: to steal something. I had a party Friday night and one of the guests made off with several of my bracelets. My friend thinks she’s so funny making off with cocktail glasses when we go to restaurants but I laughed so hard when she got caught last night. make or break something: to cause something to succeed or fail. This internship at the law firm this summer will make or break my opportunity to join a big firm after graduation. Whatever test score I get on the SAT will make or break my chances for getting into a good college. Don’t think this audition will make or break your acting career—there will be other chances if this doesn’t go well. make over someone / something (make someone / something over): to improve the way someone or something looks. They made me over at the shopping mall today and I ended up spending $250 on cosmetics that I don’t need. I love watching the home improvement shows when they make over apartments on a $500 budget. make someone sick: to make someone appalled, shocked or disgusted. I can’t believe you ate that entire bucket of fried chicken—you make me sick. Listening to my sister talk to her boyfriend in her whiny baby voice makes me so sick. make something out of nothing: make something more important or serious than it really is. So there are a few clouds in the sky… don’t make something out of nothing. We'll still go outside for a short walk and take an umbrella just in case. My stomach really hurts but I don’t want to tell my mom because she always makes something out of nothing and will insist I go to the doctor’s office. make something up (make up something): 1) to create a story or tell a lie about something; 2) to take time to do something you should have done earlier. I had no idea what the answer was for the test so I just made something up. When I asked my daughter where she went yesterday after school I knew she was making it up because I saw her at the mall with that boy. My parents are taking us on a trip so my math teacher is letting me make the math test up on the following Wednesday. make up: to become friendly after an argument or dispute. I’m really happy my best friend and I made up after our argument last week—I really felt lonely and sad the past week. I’m definitely not going to make up with my girlfriend again after what she did this time. make up something: to form part of something or a group. The four of us make up a string quartet and we play at area hospitals, nursing homes and private parties. Our networking group is made up of a variety of entrepreneurs, consultants and people who are interested in working for themselves. make up for something: to take the place of something else. I’m really sorry I can’t be there for your birthday. I will make up for it by taking you out to dinner this weekend. My husband got me a new puppy to make up for accidentally killing my goldfish. what makes someone tick: the reasons for someone’s behavior. I wonder what makes my father-in-law tick. He never says anything and shows little emotion. Historians have tried for years to understand what makes the world's dictators tick. in the making: in progress; in the process of creating something. I went to President Obama’s inauguration because I wanted to see history in the making. Happiness is in the making of ambitious goals not in reaching them. of one’s own making: something caused by one’s own actions. Yes, your boss is a tyrant but the things that led to your dismissal were of your own making. I like individual sports like running because if I lose or win it’s entirely of my own making. have all the makings of something: have all the qualities of something that could happen. This beautiful weather and the gorgeous sunset have all the makings of a romantic evening. With the tennis match tied a two sets each this match has all the makings of an epic final. a man of few words: a person who does not talk a lot, only when he has something important to say. My father isn’t shy at all—he’s just a man of few words. I prefer to be with a man of few words than with someone who enjoys listening to himself talk all day. a man of his word: a person who is honest and does what he says he will do. I hated being married to my ex-husband but he is a good father and a man of his word. I know you think this punishment is extreme but I want you to learn how important it is to be a man of his word. every man for himself: each person does what is best for himself. There is no team spirit in this office; it’s definitely every man for himself. When they put out the food it was every man for himself and I was lucky to get anything to eat. man enough (to do something): to be strong or brave enough for something. If you were man enough to tell your boss you are worth more money he’d give you a raise. My father started taking me to the shooting range because he doesn’t think I’m man enough to make it in life. fall off the map: to disappear, to no longer be known or considered. After the controversy, our math teacher quietly resigned and then fell off the map. I keep wishing that saggy pants will fall off the map someday but I still see guys wearing them after 25 years. map out something (map something out): to create a detailed plan for something. During the next hour we need to map out the topics and production schedule for the newsletter for the rest of the year. I always like to map out the general route for my trips but allow plenty of time to explore places after I get there. put something on the map: to make something famous. This is the song and video that put Britney Spears on the map. Unfortunately, the mass shooting at my high school is what put our small town on the map. hit the mark: to be correct, to reach a goal or be successful. I hope to hit the mark with this new technology for water purification. You hit the mark with that speech—Everyone listened carefully because it was so inspiring. leave one’s / it’s mark (on someone / something): to have a positive effect on something that is memorable. I’m hoping to leave my mark on this school by creating a great drama department. Michael Jackson left his mark on the music world not just with his music but also with his innovative dances, choreography and videos. make one’s mark: to be successful and famous doing something. I plan to make my mark by writing the next great American novel. He made his mark in the business world but then switched to philanthropy after he amassed a fortune. mark down something (mark something down): to lower the price of something. I actually bought two pairs of shoes because they were marked down to $49.99 from $129.00. Do you know when you plan to mark these jackets down? mark up something (mark something up): 1) to raise the price of something. 2) to make corrections or changes to a document. These are not real sales. They simply mark up the price, cross it off and write in something lower that they call the “sale” price. After the sale these prices will be marked up by 25%. I’ve marked up this report with my changes so please try to make the corrections in the next few hours. off the mark: not accurate or wrong. His comments were off the mark—or else recent studies have proven his theory wrong. When you said I looked angry you were not off the mark. in the market for something: interested in or looking to buying something. I’m in the market for a different apartment so please let me know if you hear of anything. We’re in the market to buy a new car but want to wait until the new models come out in a few months. on the market: available to have or purchase. I heard your ex-girlfriend is on the market again after her latest boyfriend dumped her. Our house has been on the market for almost two years so we’ve decided to keep it and rent it for a few years. a marriage made in heaven: a perfect marriage. If I can't have a marriage made in heaven, I prefer to get divorced than stay in an unhappy relationship. What makes a marriage made in heaven can be very different depending on the culture. a match made in heaven: a perfect match, something that goes perfectly with something else. Your grandparents were a match made in heaven, weren’t they? Living here in Paris feels like a match made in heaven for me. meet one’s match: to find someone who is equal in ability, skill, etc. My brother always thought girls weren’t as smart but when he met his girlfriend he finally met his match. The first rounds of the tournament were easy but in the quarter finals we met our match and lost by 2 points. a matter of doing something: something that must be done. Organizing this house is a matter of throwing away most of the things that you don’t use anymore. Getting into a good college is not just a matter of good grades—you also need good test scores, participation in extracurricular activities as well as a good application and essay. a matter of life and death: something that is very serious and important. Your father is in an important meeting. Is it a matter of life and death or can he call you back in an hour? I’m sorry but not having this pair of jeans is not a matter of life and death—you can save up your own money to buy them if they're that important. a matter of time: something will eventually happen or become true. Your paintings are incredible. It’s only a matter of time before you become famous. If you continue to drive like this it’s only a matter of time until you get into a serious accident. as a matter of fact: actually, in reality, in truth. As a matter of fact I am going to see that movie tonight so please don’t tell me any more about it. As a matter of fact I used to live in Paris and could recommend some good restaurants if you like. for that matter: besides, in addition. If you don’t like school then why are you enrolling in college and taking out student loans for that matter. I’ve decided to give up drinking coffee, and tea for that matter. no laughing matter: something that is serious and not a joke. Throwing a pencil at your teacher is no laughing matter and therefore we’ve decided to give you a 3-day suspension. High blood pressure is no laughing matter. You’ve got to reduce stress and stop smoking. no matter (what/how): without considering. I will be there on Sunday no matter what the weather. I can depend on my assistant to complete anything I give her, no matter how difficult the assignment. No matter how many times I ask my team to call when they are late, only a few people actually contact me. max out (max something out): to reach the limit of something. I think I’ll just read a book; I’m maxed out on watching television for a while. I’m applying for a new credit card because all the ones I have are maxed out. to the max: to the largest or highest degree of something. I love One Direction to the max. Press this button here to turn the volume up to the max. me neither: and I also am not, I also would not. me, too: and I am also, I would also. mean well: to have a good or helpful intention. I’m sure your daughter meant well when she tried to wash your phone. I know you mean well but I prefer doing my own ironing. mean business: to be serious about something. My father threatened so many times to take away my phone and nothing happened but last night he meant business and confiscated my phone. I mean business when I say I’m going to run a marathon in June. a means to an end: something that is done to obtain or achieve something else. Going to college used to be a means to an end for young girls to find their future husbands. I hope volunteering here for a year will be a means to an end for getting hired here. beyond one’s means: more than one’s budget or the amount of money that they have. Credit cards make it possible for so many people to live beyond their means. When I discovered my boyfriend was living beyond his means to impress me it made me really sad. by all means: definitely, certainly. By all means stop by to see us—we will be around all weekend. By all means take another slice of cake if you’d like. by no means: not in any way. By no means am I going to my ex-boyfriend’s wedding—why did he invite me? It will by no means be a difficult hike. The road is flat and we will stop many times along the walk to view the scenery. within one’s means: within a person’s budget or the amount of money that they have. After my husband lost his job, we learned the hard way how to live within our means. I finally learned to live within my means after I reached the limit on all my credit cards and couldn't get any more credit. in the meantime: at the same time something is happening or during the interval between things that are happening. I have to get dinner ready so please do your homework in the meantime. We will have your car fixed by Tuesday evening and in the meantime you can use one of our courtesy cars free of charge. for good measure: something added to something else that has already been done. I’ve cooked a pork roast for our dinner tonight as well as grilled stuffed portobello mushrooms for good measure in case anyone’s vegetarian. She not only won the race but set a world record for good measure! measure up (to someone / something): to be as good as someone or something else. My father never thought I’d measure up as a businessman because I was so shy and timid but I’ve been more successful than he is. My mother never thought I measured up to my older sister no matter how well I did. Lady Gaga’s latest CD does not measure up to the last. meet someone halfway: to compromise with someone by doing half or a good part of what they want. My roommates would never meet me half way with cleaning so I finally got my own place. If you can’t meet me halfway on anything then we’re not going to be a couple much longer. meet up (with someone): to see someone in person or join someone for an activity. I’m going to meet up with some of my old classmates after work if you want to join me. My parents and I usually meet up once a month on Sundays for brunch. make ends meet: to have enough money to pay for the basic necessities. After I lost my job I didn’t have enough to make ends meet so I had to sleep on my sister’s couch and eat lots of spaghetti. When I was 15 years old my parents were so grateful that I got a job to help us make ends meet. melt away: to disappear or fade away as if it is melting. The moon melted away into the thick clouds. After my mom stopped taking her anti-depressant medication the pounds just melted away without dieting at all. If you want to buy a new Michael Kors purse you'll have to pay for it yourself. Money doesn't grow on trees, you know. 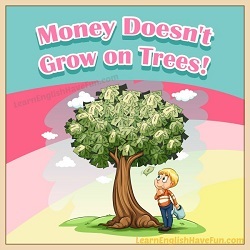 When young people get their first credit cards they have to often learn that money doesn't grow on trees. This old car is a money pit so I'm saving my money to buy a new car in the fall. We joined the country club and it's a real money pit. There are fees for everything but we wanted our kids to have the right social connections and opportunities to swim, and play tennis and golf. I'll be over the moon when you get a job and move into your own apartment. I was over the moon when I received the invitation to your wedding. I'm so excited for you! I recommend you let him foam at the mouth for a few hours then try to talk to him when he's calmed down. My ex-husband constantly foamed at the mouth and I finally had to leave him because it was frightening and stressful. I won't believe she's leaving the company until I hear it straight from the horse's mouth. Yesterday, I had a meeting with Professor Jones so I heard that no one passed the macroeconomics exam straight from the horse's mouth. Have you signed-up for my free newsletter? 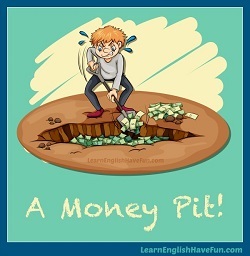 You'll learn many new vocabulary and idioms each month. 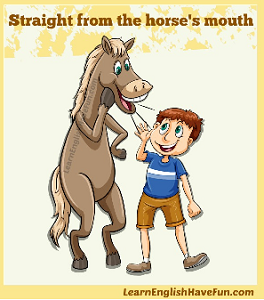 You can also find many idiom definitions by using one of the online learner's dictionaries. Although I mentioned above that understanding idioms is the most important thing for English learners, it's easiest to check your understanding by writing some practice sentences of your own. This will make sure you truly understand the meaning. Idioms are tricky. Simply choose one or several M idioms from the list and create your own sentences in the comments box below.